Many fine suggestions have already optimised working practices in several areas. Nigel K. Taylor will be heading ESVAGT’s office at Dock Gate House in Aberdeen. 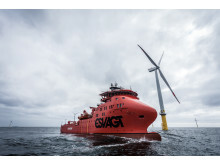 ESVAGT has significantly upgraded its warehouse and logistics facilities. The buildings connected to the new premises at the Dokhavn will be equipped with workshops, stores and logistics facilities – unifying ESVAGT in a single location with a single architectural style. The secretariat for the Tall Ships Races was based in the offices that ESVAGT recently acquired from IAT.